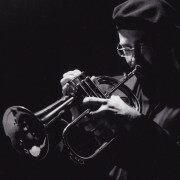 Sunday, May 18, 7 p.m.
Siskiyou Music Project welcomes back flugelhorn master Dmitri Matheny with a very special program featuring the music of two jazz icons, Art Farmer and Jim Hall. Dmitri Matheny has a very special connection with Art Farmer who was his teacher and mentor, in fact Dmitri still plays Art’s horn, and with Jim Halls recent passing we thought this would be a good time to feature the music from this classic jazz quartet, which played together from 1962-1964. The performance will also feature the compositions of Jim Hall as well as the arrangements from the Farmer/Hall Quartet. From the liner notes of the first quartet recording: A horn quartet with guitar has a distinctive sound, different from a quartet with piano. If you’ve heard any of the great recordings Art Farmer did with the Gerry Mulligan Quartet (1958), you’ll know that Art enjoyed the two-horn, piano-less quartet sound. The Art Farmer Quartet with Jim Hall, two instrumentalists with individual and intimate sounds, is unique. First of all, Art plays flugelhorn exclusively, rather than trumpet. The flugelhorn, with a bigger bell than the trumpet, has a deeper, darker and warmer sound. Art knew it would blend well with the guitar. Second, although the guitar can certainly be a chordal instrument, and “comp” (accompany) behind the soloists, it’s also a great linear instrument, and the blend of the timbre of flugelhorn and guitar linear lines was also very appealing to Art. Plus, the guitar can at any time switch from playing linear melody to playing chords, further expanding the sonic palette. Sunday, April 20, 7 p.m.
Siskiyou Music Project welcomes back the Los Angeles based Jessica Fichot Group for a performance at Paschal Winery on Sunday, April 20. On her second full-length album, Le Secret, Jessica Fichot stirs a musical melting pot of styles and cultures. The Los Angeles-based artist’s music is an international meeting point for French chanson, folk, gypsy jazz and world music. Lilting harmonies sung in French, Chinese, and Spanish cascade alongside accordion, clarinet, toy piano, strings and a variety of exotic instruments and organic percussion. Thriving on extremes, there are moments of heartache, and there are moments of exhilaration. It’s intricate, yet it’s also infectious. Ultimately, everything converges in on Le Secret that’s meant to be handed down for generations to come. Fichot really has no choice but to create diverse art. Born in Upstate New York to a Chinese mother and French father, she spends her youth in France. After earning a degree in audio engineering in Paris, she enrolled in Boston’s prestigious Berklee College of Music to study songwriting. While in Boston, she penned countless children’s songs for musical theater and later, for educational programs. Over a hundred of her songs are published as part of ESL programs published in over a dozen countries. Relocating to Los Angeles, she embraces her international influences and independently releases her critically acclaimed 2007 debut album, Le Chemin, garnering the stamp of approval from tastemakers such as LA Weekly, San Francisco Chronicle, and KCRW – and licensing a few songs in major movies and TV shows on the way. 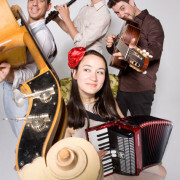 She also gets a chance to tour the world – traveling regularly throughout the U.S, and even to Mexico, China and Europe – performing on vocals, accordion and toy piano and accompanied by a fiery band of clarinet, double bass and guitar. Fichot seamlessly shifts between languages and styles artfully, crafting an intriguing journey that beckons listeners to come back. Siskiyou Music Project presents vocalist Kendra Shank with jazz guitar icon John Stowell for an intimate concert and CD release event on Saturday, April 11 at Paschal Winery in Talent. 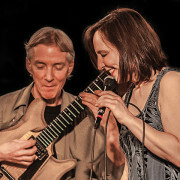 Based in New York, vocalist Kendra Shank and Portland based guitarist John Stowell have been performing together sporadically for the last twenty years. In 2012 they began an informal recording that eventually became “New York Conversations” which will be released in April 2014 by the Swiss label TCB. Kendra Shank, acclaimed for her “delectable voice” (Time) and “breathtakingly original concept” (Boston Globe) joins master guitarist John Stowell who “seems to pull arching motifs out of thin air, eschewing clichés” (All About Jazz), in this co-led project. The interactive duo pushes boundaries with a personal mix of Stowell originals (some with Shank’s lyrics), reimagined jazz standards, a Fred Hersch/Norma Winstone song, a folk song medley, and free improvisations. Moods range from intimate tender ballads to mixed meter jaunts, syncopated swing, sensuous samba, and the evocatively experimental. Stowell plays pianistic chords and rich unexpected harmonies on a colorful array of guitars: electric, steel string acoustic, nylon acoustic, and fretless. In addition to her compelling interpretations of lyrics, Shank improvises multi-layered wordless collages using an electronic looper and other effects, functioning as an instrumentalist in organic interplay with Stowell. Born of an impromptu Manhattan studio session, New York Conversations is music created in the moment and captures the playful, conversational synergy that results from this duo’s two-decade collaboration. 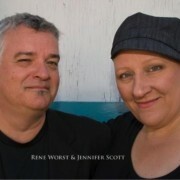 Friday , March 28, 7 p.m.
Siskiyou Music Project welcomes back from Vancouver British Columbia vocalist/pianist Jennifer Scott and bassist Rene Worst for a very intimate performance at the Old Siskiyou Barn on Friday March 28 with special guest guitarist Ed Dunsavage. Considered the finest jazz vocal improviser in Canada by her peers, her fans and by the musicians who work with her, Jennifer Scott is an important jazz voice. She has performed with such jazz greats as: Gene Bertoncini, Clark Terry, Tommy Banks, Paul Horn, Kenny Wheeler and Peter Bernstein to name a few. Jennifer has performed to sold out crowds from San Diego to Vancouver to Whitehorse on the West Coast of Canada and has begun a major foray onto the world stage including performances in Amsterdam, Milan and Rome. Recent lauded performances have included Main Stage shows at the Vancouver Island Music Fest sharing the stage with artists as diverse as Jane Bunnett and Jerry Douglas. She received a lengthy standing ovation reception for her duo set with bassist Rene Worst at the same festival. Jennifer was also featured at Stanford University performing at the Miles Davis tribute concert for their Concert series in tandem with The Jazz Museum in Harlem. The music presented in this evening’s performance will be from her newest releases “Sonho Meu” featuring the music of Brazil. Special guest Ed Dunsavage will be joining them on guitar. Rene Worst is one of Canada’s top jazz bassists and he has performed and recorded with a who’s-who of jazz elite including: Chet Baker, Ernestine Anderson, Mark Murphy, Freddie Hubbard, Joe Pass, Herb Ellis, John Handy, Barney Kessell, Eddie Harris, Gene Bertoncini, Jessica Williams, Bud Shank, Paul Horn and many others.